This Guide lays out a superb long distance walk, going west to east with the wind on your back, from the Irish Sea coast, through three National Parks, each an upland area of outstanding natural beauty, to the North Sea 190 miles away. 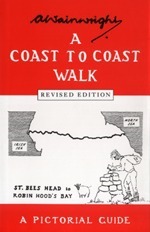 This is the original Coast to Coast guide, written by that unlikeliest of all cult figures, Alfred Wainwright. He makes it plain in his introduction that he had in mind to set people free from the need to follow each other along identical routes, as he found they were doing with the Pennine Way in the 1970s. Don't be "merely followers of other people's routes" he exhorts, and, as this route has not been dedicated as a long distance path and isn't way-marked, there are plenty of occasions when you can express yourself in a way he would have applauded: Ennerdale via the valley bottom or via the High Stile ridge; through Grisedale or by a choice of high routes, Helvellyn or St Sunday Crag; there are countless approaches to the Vale of Mowbray, and will you join Wainwright in missing that interesting and lovely village, Osmotherley? What first attracted the walking community to Wainwright's guides was his unique presentation. This book, as with the guides to the Lake District which preceded it, is written in his immaculate handwriting and illustrated with his precision and his keen eye for detail in highly skilled drawings. Wainwright loved his mountain tops and from each high point he makes a compass and fills in the names of all the points of interest visible on its bearings. He loved his country churches and he picks out their distinguishing features with both drawing pencil and authoritatively researched historical background. His observational skills are sharp and he has an eye for what matters in a place and for the quirks it might prefer to hide. His style is interlaced with gently laconic humour. See Page 6, for example, on how to cross a barbed wire fence.